Merry Christmas! Did Your Presents Make You This Happy? By now, most households should be buried in shredded wrapping paper, unless yours is home to a fastidious person always ready with a trash bag and a dustbuster for those flecks of styrofoam packing that get everywhere. Anyone get any games? Anyone get a console? My parents live in town, and before I drove over Dad made what I thought was a very suspicious request: Bring over my Xbox 360. "Let's play some games," he said. I was certain this was a setup that had to do with a Christmas gift for me, which was going to be awkward as I have just about everything already on account of work. No, that really was it. He just wanted to play some video games. After struggling with NFL Blitz and NBA Jam we settled on golf. So that's my gaming Christmas morning, teaching my father where the X, Y, A, and B buttons are on a 360 controller, telling him what "big head mode" does, and hitting drives off the putting green into a parking lot. Reese (below) got both last year. Remember him? He's the little guy who was honestly thrilled to get Tank! Tank! Tank! for Wii U, a game that ... didn't do too well in its Metacritic score. 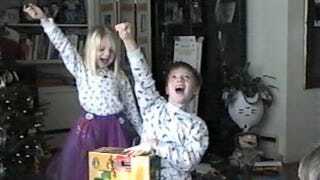 But as heartwarming Christmas morning videos go, it's right up there with the Nintendo 64 kids. So, what kind of Christmas did you have? Share it with us in the discussions below.